Vicki Entrekin, part of the Angel Project, bows her head outside of the funeral service for U.S. District Judge John Roll at St. Elizabeth Ann Seton Church. Roll was one of six people killed in the assassination attempt on Rep. Gabrielle Giffords. 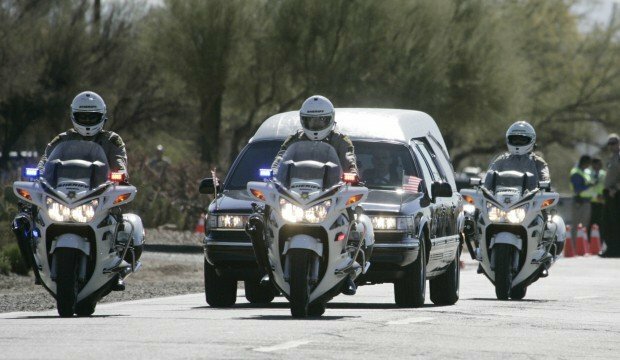 The hearse leaves after the funeral Mass for Roll on Tucson's northwest side. He was remembered as a hardworking judge with a law-and-order bent but an unshakable reputation for fairness. The chief judge of the U.S. District Court for Arizona would have celebrated his 64th birthday next month and his 41st anniversary soon. Part of the overflow crowd that attended Roll's funeral Mass makes its way to the church. In the hours of shock and grief after the death of U.S. District Judge John Roll, as the family gathered outside at the Roll home, an iridescent blob of green feathers fell from the sky. It was a hummingbird. Presuming it was cold, the family put it in a towel and held it until it revived and flew to the spot where the children were gathered. One of the grandchildren interpreted the unusual event as a sign that "Papa is in heaven." Those words of comfort were delivered to about 2,000 mourners Friday from Roll's brother-in-law, Michael O'Connor, as Tucson said its goodbyes at a memorial Mass. So many came, the church couldn't hold them all. The street was lined with supporters, about 16 wearing large white angel wings and holding red roses, when thousands came to bid farewell to the chief judge who was among the six killed in the attempted assassination of U.S. Rep. Gabrielle Giffords Saturday. Roll would have been 64 next month. In the coming days, the judge who was widely regarded as a man of faith and family, would have celebrated his 41st wedding anniversary. Cars carrying well-wishers stretched for miles along North Shannon Road in front of St. Elizabeth Ann Seton Roman Catholic Church, as U.S. marshals and other law enforcement set up checkpoints along the way. The security was in marked contrast to the funeral the day before at the same church for 9-year-old Christina-Taylor Green, also killed that day. In keeping with the Roll family's wishes, the media did not attend the ceremony. But those who were there described what they'd seen and recalled a man who was fair and warm. Many were attorneys who worked with Roll or appeared in his courtroom in the past. Madeleine Wanslee, an attorney, interviewed with him for a job in 1987, when he was appointed to the Arizona Court of Appeals, prior to his 1991 nomination to the federal bench. He called her personally to tell her she didn't get the job. Fast-forward 20 years. She's now a practicing attorney, and another judge had been writing her a thank-you note when Roll noticed the name and remarked that he'd interviewed her way back then. The judge sent Wanslee an e-mail asking if it could possibly be true that Roll's memory was that infallible. More recently, she was in the running to be head of a group set up to improve communication between judges and attorneys. When Roll called her personally again to tell her she came in second, she chided him for calling her only with bad news. But when the head of the group had to step down in spring 2010, Roll called again, this time telling her to mark the date on the calendar, since he was delivering good news. "He's one of those people who makes you want to do better and be better," Wanslee said. "There was an inherent goodness in him that makes you want to be more kind to others and to go the extra mile." Ray Panzarella, 55, was sworn into the federal bar by Roll in 1994. He went to Roll's court for many cases, and was just there Friday for an administrative matter in a case. "He was a very fair man, one of the hardest-working judges you would find," said Panzarella, who described Roll as circumspect and cordial. Panzarella recounted a case he had in Roll's courtroom just before Christmas. Prosecutors were pushing for a two-to-five-year sentence for Panzarella's client, as part of a plea agreement for a drug charge, he said. Roll was inclined to reduce the sentence, and asked the prosecution to talk him out of it, Panzarella said. When the prosecution couldn't, Roll sentenced the offender to a year. It was the last sentencing he had in Roll's court. "It was a very nice memory of him. My client was very grateful. He would surprise you because he was very law-and-order," he said. "There's a great big hole in our hearts and in our court right now," Panzarella said. Former Vice President Dan Quayle was in attendance, carrying a personal note from former President George H.W. Bush, who appointed Roll to the federal bench, to the Roll family. U.S. Reps. Raúl Grijalva and Jeff Flake were there, as was former Rep. John Shadegg. Giffords' district director, Ron Barber, who was wounded in the hail of gunfire, was in attendance. Recognized by Bishop Gerald F. Kicanas, Barber received sustained applause. Sen. John McCain, who recommended Roll for the federal appointment, was in attendance, along with Sen. Jon Kyl. The two announced they are sponsoring legislation to make Roll the namesake of the new Yuma courthouse, which should begin construction in July and for which he had been a strong advocate. "Our state has lost an outstanding jurist, a true and able public servant and a great Arizonan," the two said in a statement. The homily was delivered by Father John Lyons, a childhood friend of Roll's dating back to elementary school. U.S. District Court Clerk Richard Weare told the crowd Roll acknowledged being a member of the Young Democrats in college. Weare said he was sworn to secrecy, but said he just had to tell that story, as the crowd chuckled. The ceremony closed with "When Irish Eyes Are Smiling." To a person, those interviewed recalled Roll as a man of fairness and competence. John Neis worked with Roll when he was an attorney, a Pima County Superior Court judge and then a federal judge. Roll was "a man of extremely high integrity," said Neis, a retired defense attorney. He kept a professional distance from attorneys and had high ethics. "We lost a very valuable judge," he said. "He was always a man willing to listen and be extremely fair and always able to understand a situation." When Neis retired and started to do work for the Tohono O'odham Nation, Roll was generous in opening up his courtroom for an educational session. "I know John well enough to know he was involved in lots of community affairs," said Neis, who estimated he had far more than 100 cases in Roll's courtroom. "He spent an enormous amount of time in charitable organizations and was very involved in his church." Roll was the "ultimate" in what one would expect of a judge, he said. "He was an extremely hard-working attorney. I was always on the other side, that's the problem," Neis joked. Paul Holbrook, a 55-year-old attorney, remembered Roll as someone who was even-tempered and well-liked. "The one thing about Judge Roll, he knew everything about your client. He was very thorough," Holbrook said, adding it could be intimidating practicing before him. "You weren't going to sneak anything by him, that's for sure." Barbara Rodriguez struck up a friendship with Maureen, Roll's wife, when the two were in school at Pima Community College. The judge encouraged his wife to go back to school, and when they got together with their husbands, Rodriguez noted "how nice and caring he was. He's just such a super nice guy." If you didn't know he was a judge, she said, he was a ordinary guy who didn't change after he was sworn in to the federal bench. Many well-wishers came with no intention of going into the church, but just wanted to be part of showing support to the community. With bagpipes playing as people filed into the church, 54-year-old Jay Stanforth walked along the line of spectators and handed out long-stemmed red roses. He didn't know Roll personally, he said, but wanted to be part of the community healing in some way. At the funeral of 9-year-old Christina-Taylor Thursday, Stanforth said someone handed him a rose and he decided to do the same Friday. "We don't want to be in the funeral but want the family to know that positive energy is surrounding them," the retired elementary-school teacher said. Packing two camping chairs and a cup of coffee, Jason Terpstra, 34, a technician for a heating and cooling service, said he knew Roll when he was a child and used to call him "Uncle John." Terpstra said he showed up on this chilly morning "just to be here. Just to remember." Meanwhile, Rosemary Mancillas, 56, said she joined the angels group with a sense of wanting to protect the families. "I wanted to honor and respect the judge. I didn't know Christina-Taylor Green either, but that doesn't matter. It's community," she said. "It's about the families and we didn't want them exposed." 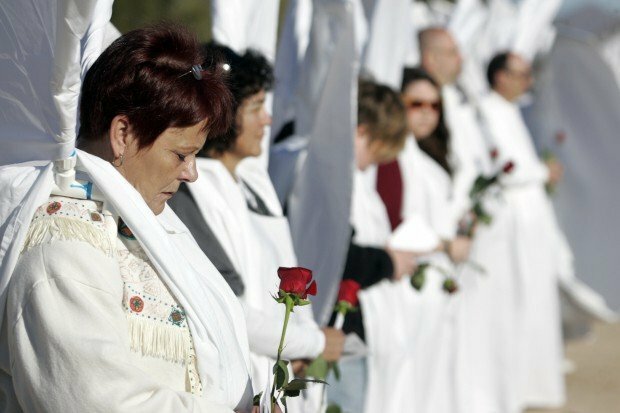 Mancillas said it has been important for the community to come together in the week since the shootings, which is why people wanted to block the families from potential protests, such as those proposed by Westboro Baptist Church of Topeka, Kan.
"I just felt you can pass things off to other people all the time. When I heard that group was coming, I said not here, not now," Mancillas said. Joining with others to demonstrate Tucson's community support "helped me deal with the anger and the grief," Mancillas said. "You can't get through stuff like this without it. It dissolves that anger because you're doing something positive." Contact reporter Rhonda Bodfield at rbodfield@azstarnet.com or 573-4243. Contact reporter Andrea Kelly at akelly@azstarnet.com or 807-7790. The funeral for Federal Judge John Roll was held Friday, January 14, 2011. Roll was one of the six people killed January 8, 2011.